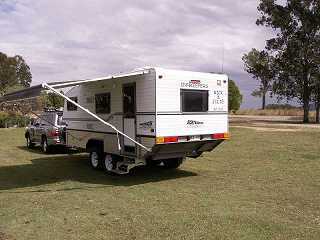 We bought it in June 2007 from a couple in S.A who bought it new in July 2003 and had not had the time to use it, traveling only 5000 kilometres with it in that time. 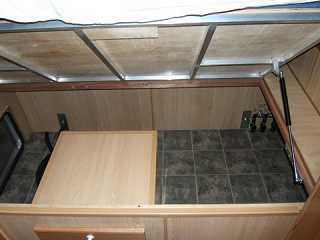 This one has the Queen Sized "Yacht Bed" which means it has one side up against the front wall. This gives you more living area as an island bed is 2 feet longer than the Yacht Bed is wide. This option also gives you more under bed storage area too as Bushtracker have the bed at hip height and there is a "Shed" full of storage under there. It was well set up for creature comforts in the bush, but we wanted to get a few extras before we set off on this adventure. Most importantly was the suspension....we noticed that it looked like it had sagged as it didn't look to have the same ground clearance as most Bushtrackers we had seen. On close inspection, the springs looked fine, but the previous owners had ordered it built with 100mm lowered suspension for reasons of their own. So we upgraded to the full height suspension and also from the standard 3 tonne spec to the 4 tonne spec with 3.5 tonne spring pack. We then added a 4th 80 Litre water tank with it's own pump and separate outlet and this was to be used for drinking water only, while the existing 3 tanks were plumbed to the kitchen sink and the shower/vanity. With this system we can COMFORTABLY stay in any remote location for up to 10 days at a time before we need to find water again. This allows us both to have a shower every day if we're careful. Actually our drinking water will last us 14-16 days from that one tank or we can close off the other 3 tanks and keep them for drinking water which allows us to extend our stay to 2 months if we are camped by a permanent water supply like a river or creek. 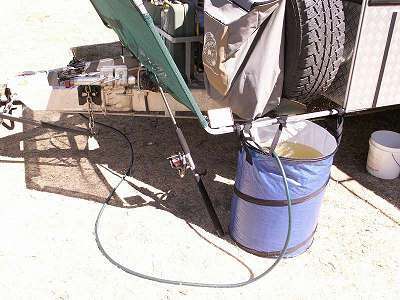 So if we're camped by a waterhole we can draw water for the shower and hot water system from a separate suction line on the draw bar. 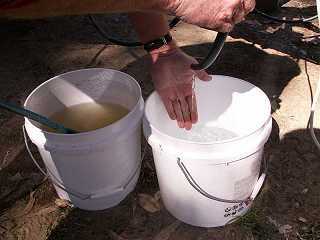 We just bucket water to a 110 Litre tub and switch over to that. We also have a water filtration/steralisation system that lets us filter the suspended colloidal clay from the muddy water and turn it into crystal clean water. Because we have water, the only other thing needed to sustain us comfortably is power. 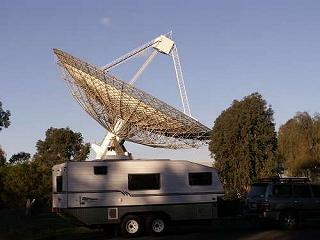 Our Bushtracker has 3 X 120Watt solar panels on the roof and they charge our 3 sealed batteries while the sun shines. If the sun don't shine, we have the Honda EU20i generator to provide 240 Volt power and this also runs the 40 Amp Xantrex True Charge 2-40 battery charger in the van to top us up again. So with Power and Water, we can sit by a waterhole for as long as we like or the food runs out. 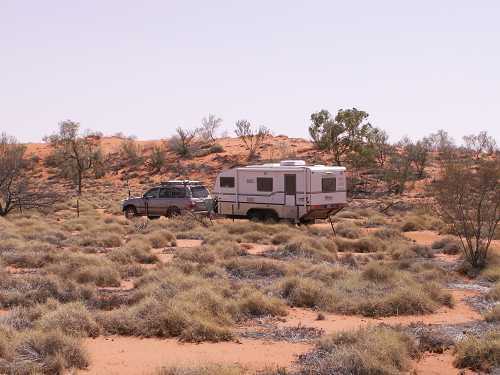 The food will last a long time as our Bushtracker has a 190 Litre 2 door fridge freezer and we also have 2 X 40 Litre Engel Fridge freezers in the Landcruiser, not to mention the pantry full of goodies. 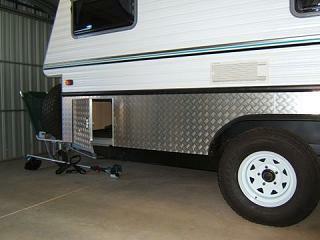 We also wanted to have some shade so we put on an Aussie Traveller Sunburst Eclipse Roll Out Awning. Just so easy to use and sets up in less than a minute and rolls away in less than a minute. 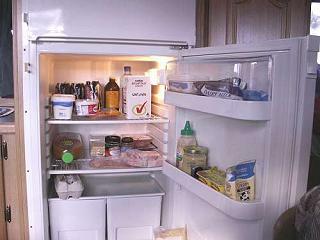 If it's easy to use, it will get used. If it's a hassle to use, it will be used less. When we picked up the Bushtracker in June, the weather was fine but freezing at night and we instantly decided that we'd install a heater. Yes, the Roof top Air conditioner has a heating cycle, however we didn't want to run the generator every time we wanted to be warm in the bush. So we went with the Webasto diesel fired fan forced heater. Just fantastic...a 2 kw heater that runs on diesel and only uses a litre every 6-8 hours. We had the control fitted at the bed head so we can just turn it on in the morning before getting out of bed. Nice to get up to a warm van instead of freezing your bum off. 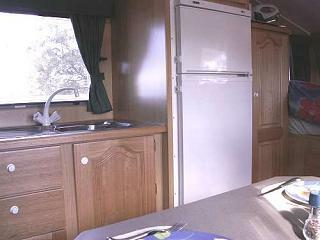 The layout and fittings work very well for us and we can pull up anywhere and be comfortable in any weather or situation for as long as we want. Being fully self sufficient like this we don't have a need to rely on caravan parks to supply our power and water and this opens up so many opportunities for us. 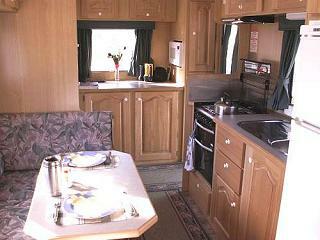 After all, the scenery and wildlife we travel so far to see are not in the caravan parks.